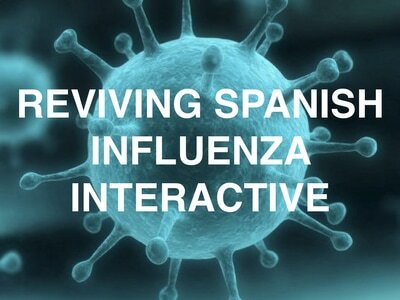 ​I can explain the impact of the Spanish Flu Pandemic. Directions: The first thing you need to do is read about the Spanish Flu Pandemic. 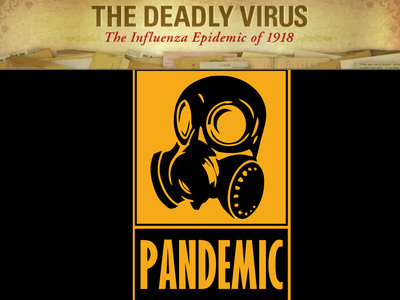 Make sure that you are looking for the impacts of the Spanish Flu Pandemic during the reading. In flew Enza - say it fast and it becomes "influenza." It was a catchy little rhyme, and boys and girls skipped rope to it. It was an epidemic; no, it was worse than that. It was a pandemic. A pandemic is a disease that spreads across many nations. This one went around the globe - and it was deadly! It's Not In Kansas Anymore! It started like any flu with a cough, headache, chills, and fever. It was called the "three day fever" when it began even though it took a month for most to recover. 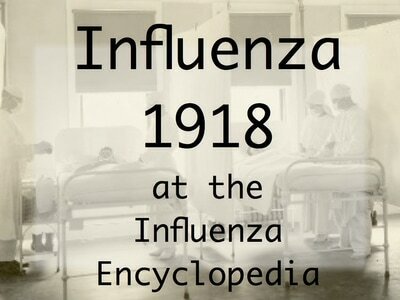 In March of 1918, the flu broke out in Kansas. In the months that followed, it spread to nearly every part of the world. It began just as World War I was coming to a close. 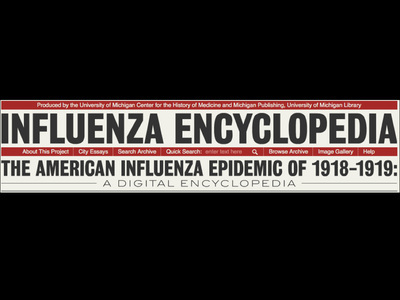 The epidemic received worldwide attention in the press after it hit Spain in November of 1918. 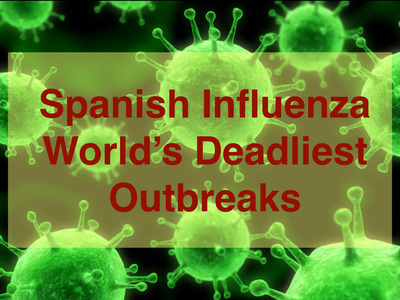 People began to call it the "Spanish flu." Often times the patient would develop dark spots on their cheeks. The lungs filled with a thick fluid. As the fluid filled the lungs, the body parts that could not get oxygen began to turn blue. Many Spanish flu victims suffocated. This particular strain of flu seemed to attack the young and the strong. As their bodies fought the illness, their lungs were destroyed in the process. Doctors and scientists worked hard to find a vaccine for the Spanish Flu. At one point, scientists felt like they had discovered a vaccine that worked; however, it did not. This was because scientists were on the wrong track. Scientists thought that Spanish Influenza was caused by bacteria, but it was not. It was caused by a virus. No medicine or treatment was ever found that could stop this disease. A pandemic is an epidemic that has spread over a wide geographical area. Estimates of the Spanish flu pandemic's deaths range from thirty to fifty million people around the world. About twenty million died in World War I over four years. The flu death toll proved to be far worse than that of the war. The first known case was reported at Fort Riley, Kansas. Within a week, 500 people had come down with the illness. It quickly spread across the country and to Europe. Two million troops were sent to Europe as reinforcements for the war. It appears they carried the virus to France, England, Germany, and Spain. During the first three weeks in May, over ten thousand English troops reported sick. The epidemic spread to China, India, Japan, and the rest of Asia by summer's end. When experts thought they had seen the end of it, the flu re-emerged in Boston in early September. This strain attacked so quickly that people literally dropped dead in the streets. At Fort Devens, Massachusetts, nearly 100 people died every day, including doctors and nurses. There were so many dead bodies they had to be taken away in special railroad cars. In Philadelphia, 289 people died from the flu in a single day in October. Eight hundred fifty-one people also died in New York on one day the same month. Public meetings were banned in many places to try to stop the disease. Even churches were shuttered to protect the citizens. In Ogden, Utah, officials quarantined the town. No one was permitted to enter or leave without a doctor's note. The pandemic traveled to villages as far north as the Arctic Circle. In some remote places, entire villages were wiped out. 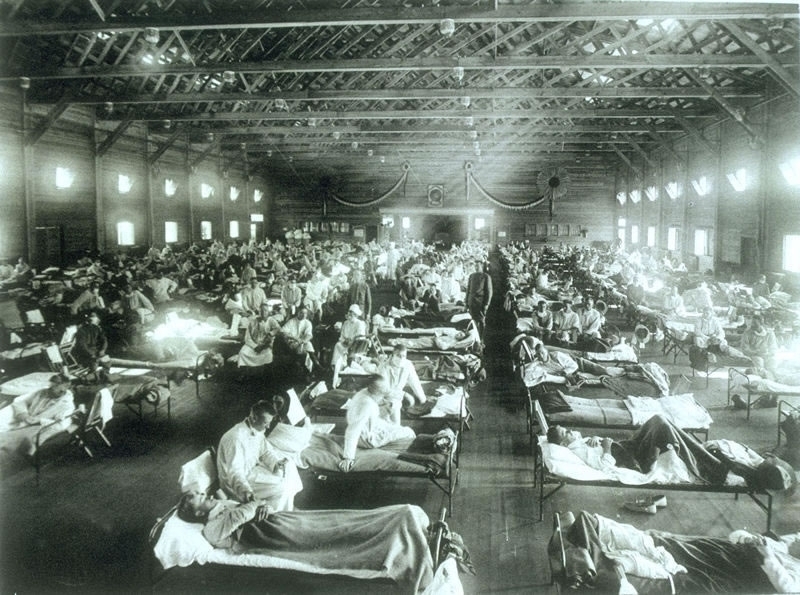 October 1918 became the deadliest month in U.S. history when 195,000 people died from the Spanish flu. It seemed nothing could stop it. By November, 115,000 more people in California had contracted the disease. Woodrow Wilson, then President of the United States, came down with the flu while negotiating the Treaty of Versailles. When the worst was finally over, we are told that this epidemic was so disastrous that it actually shortened the life expectancy of U.S. citizens by twelve years. Nearly one hundred years have passed since this epidemic raged around the world. It has since been learned that the virus originated from birds. There have been two other pandemics since 1918: the Asian flu of 1957, and the Hong Kong flu of 1968. 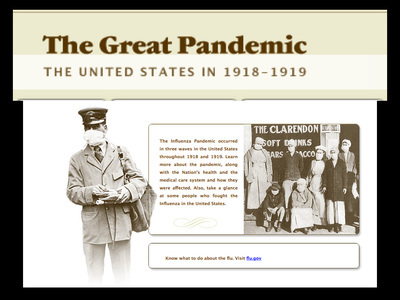 The Spanish Influenza Pandemic of 1918 played such a part in world history that it is often mentioned in books and movies today. In the picture to the right, the young man in the bed in dying of Spanish Flu. The picture is a scene in a movie and the movie is based on a book series. Does anyone recognize what movie this picture is from? Directions: The second thing you need to do is show that you understand what you have just read. In your small groups, answer the questions below in your Lesson 1 - Another Creepy Kid's Rhyme Lesson Chronicles, under the Explain It Header. We will discuss these as a whole group when you have completed these in your small groups. 1. In what U.S. state was the flu thought to have started? 2. 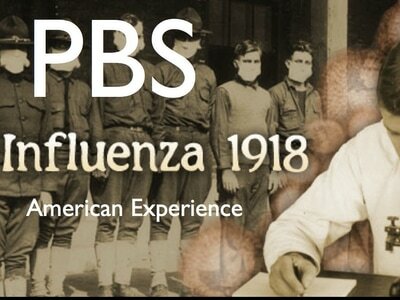 Why was it called the "Spanish" flu? 3. 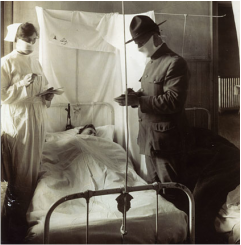 How did the Spanish flu death toll compare with that of World War I? 4. How many people died every day at Fort Devans during the pandemic? 5. Which city decided to "seal" their town so no one could leave or enter during this time? 6. Why is October 1918 considered the deadliest month in U.S. history? 7. 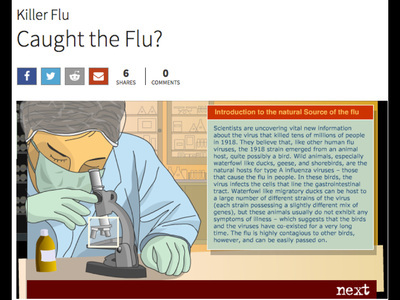 Why is it important to learn about the Spanish Flu Pandemic? Directions: The third thing you need to do is break down what you have read. 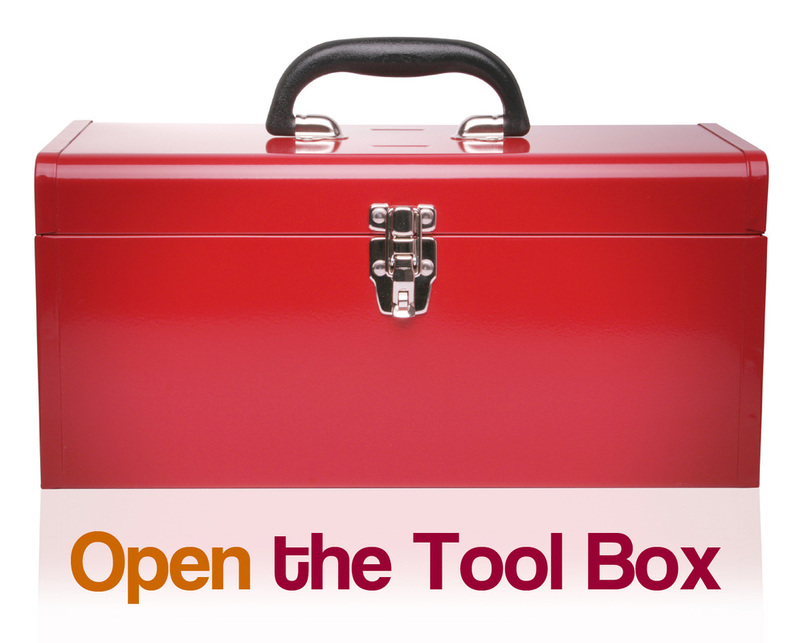 In your small groups, you will participate in a situation poll. 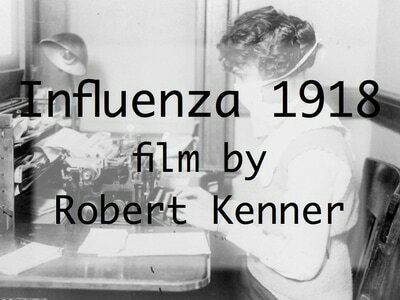 You will be given a real situation that people were confronted with during the Spanish Flu Epidemic. You will vote on what you would have done. You will then be presented with a new situation based on how you answered. At the end of the interactive, you'll see what decisions were really made during the Pandemic and see how other people voted in the poll. When everyone is done we will discuss how you voted and why you voted the way in which you did. 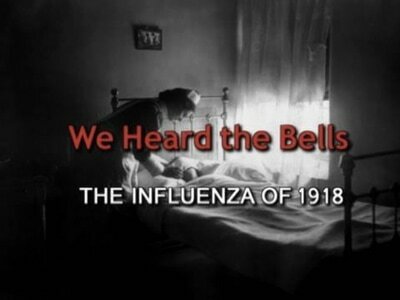 If your group finishes early, put on your headphones and watch the following movie about Spanish Influenza called, We Heard the Bells. Then explore other sites and interactives by clicking on the icons below the movie. Directions: The last thing you need to do is to prove that you have met the lesson target. 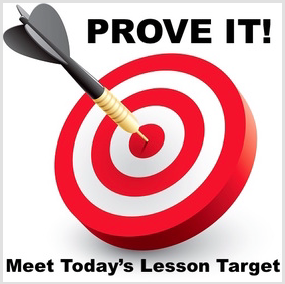 Click on the lesson target icon below to complete the Prove It Activity. You have completed Unit 4 Lesson 1 - Another Creepy Kid's Rhyme.